I’ve told the story a billion times: I’ve loved Céline Dion forever, and tried to win tickets to see her in concert when I was 12. My best friend and I stayed up all night, and when we were finally the first callers, the DJ said he “just needed to make sure we were 18” in order to get the winning tickets. We weren’t, and instead of lying, I ran upstairs to get my mom. By the time I got there, the radio man at 95.7 WZID was already on the other line, announcing a ticket winner who was not 12-year-old Alison Feller. Curses! But I did get to see Céline last year when she was in New York City to perform on the Today show, and — major bonus — I got to meet her. Dreams can come true! Take that, 95.7 WZID! Then I got sick. I’ve been in this Crohn’s flare for a month and a half now, and while it’s a major bummer, I wasn’t going to let it keep me from seeing my girl. Plus, this was Céline’s last show of her spring/summer run — she’s going on a European tour for the summer, and won’t be back in Vegas until the fall! It had to happen now. I watched Big Little Lies on the plane, and I know I’m so late to the game but oh my god I loved it. Does anyone want to talk about it? It was so so good and entertaining. I really want to talk about this so please let me know if you’ve seen it and let’s discuss. Despite this flare and the fact that I was constantly looking out for the closest bathroom, Laura and I had a great trip. She had never been to Vegas, and I’ve been a handful of times, so I got to play tour guide! We stayed at the Bellagio and our room had a view of the fountains, which I love. I remember being in Vegas a few years ago and watching the fountain show, which is set to music. The water was dancing to the song “Time to Say Goodbye,” and I loved it so much and thought it was so beautifully choreographed that I just stood there and cried. I love those fountains. I want to be a Bellagio Fountain Choreographer. And I really like Las Vegas! I know a lot of people think it’s crazy or smelly or dirty, but I don’t go all-out-party-mode in Vegas (obviously — all my clothes are spandex and I love a 10 PM EST bedtime). 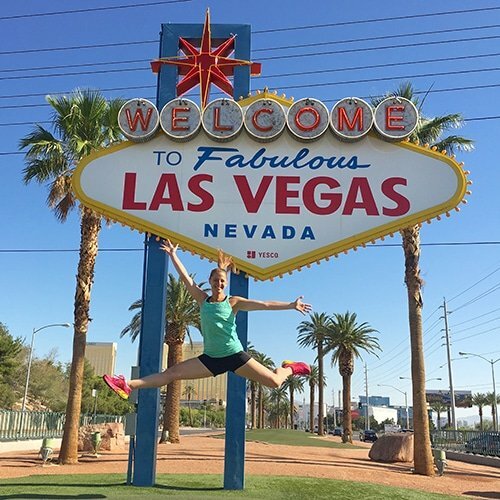 I figured the best way to show Laura the sights along the Strip would be to run them! 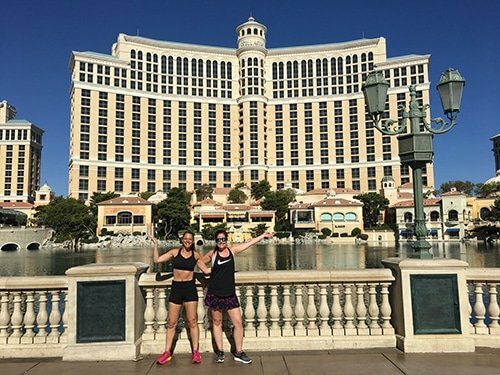 So on Friday morning, we ran from the Bellagio to the “Welcome to Fabulous Las Vegas” sign and back. We hit up the hotel buffet for breakfast (when in Vegas! ), then spent the entire day by the pool. I wore a lot of sunscreen and stayed mostly in the shade. I’m really growing up. Eventually we showered, watched 20 rounds of fountain shows from our room, and then went to Spago for dinner. Brian and I had gone to Spago for his birthday dinner back in 2011 (wow that post takes me back! ), and I remember loving it, but it was not great this time around. Bummer. And my stomach was killing me on Friday, so we were happy to pass on dessert and get to bed. Saturday was show day, so I wanted to be on my A-game. 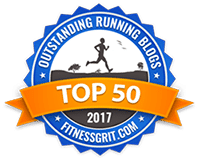 We ran in the morning — this time to the Stratosphere and back, which is my preferred direction to run in Vegas because there are fewer overpasses to navigate. We had an amazing breakfast at Mon Ami Gabi, laid by the pool for exactly one hour (I didn’t want to be out too long since the sun wipes me out and I wanted to be well-rested for Céline! ), then relaxed in the room watching more Big Little Lies. While we were getting ready, the fountains started to dance to “Time to Say Goodbye.” I freaked out. Again. It was shaping up to be a remarkable day. We went to an early dinner at Rao’s, which was the best meal of the trip, and the server told us that Céline goes there every night before her show and orders the lemon chicken! And she orders it herself! Céline Dions, they’re just like us! Then it was showtime, and I was psyched. Was it the greatest concert of all-time and the best night of my life? Have all my dreams have come true? I feel like many of my dreams have come true, and I loved the show — though I actually liked her performance at the Today show better! 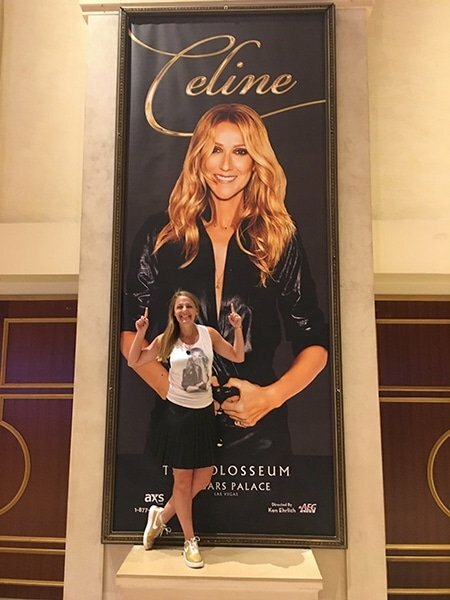 Céline has been doing this show in Vegas for years. This was something like her 1,105th show at Caesars (that includes A New Day performances). And while she gives it her all, it definitely feels planned. At Today, she improvised, she shook things up, she was silly, and you could tell she loved the freedom of being able to go a little rogue. This show is clearly very second-nature to her, and it felt a bit scripted and over-rehearsed — which I get! How can it not when you do it every single night for months, years at a time? I worship Céline and the ground she dances on. If this were the first time I had seen her, I’d be losing my mind. But Today spoiled me. And I hate to be critical of an audience full of strangers who are probably nice people…but I’ll do it anyway. I am all about audience participation, and as someone who goes to a lot of shows and has performed on many stages myself (totally have that in common with Céline…), I really value a great crowd. But this crowd was not great, and was not good enough for Céline. I expected it would be a lot of older people, and I love older people. They’re fun and sassy! But everyone just sat in their seats from start to finish and calmly clapped at the end of each number. There was no rowdiness! I wanted to scream, “You people are seeing Céline Freaking Dion, can you please get on your feet and dance a little? !” I was standing and dancing and loving life, but I felt like the only one in our section doing so (people in the section closest to the stage were dancing, too, and those felt like my people), so I felt a bit self-conscious about it. Eventually I stopped caring, and no one around me seemed bothered, but I wished people had seemed more excited and #soblessed to be there. Get on your feet, audience! Unless you have a physical disability, in which case it is OK to stay seated as needed. Do you! If you are considering going to the show, do it. She really is the most talented woman to ever exist, and you should see her live. Girl’s got pipes, and she was born to be onstage. 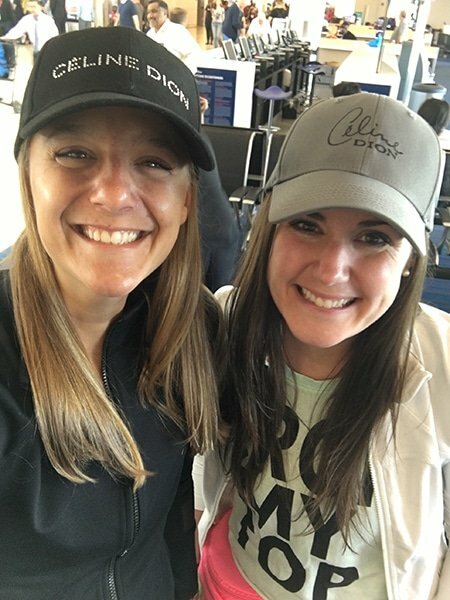 By the time Laura and I headed to the airport on Sunday, my stomach felt so good — better than it had in weeks. 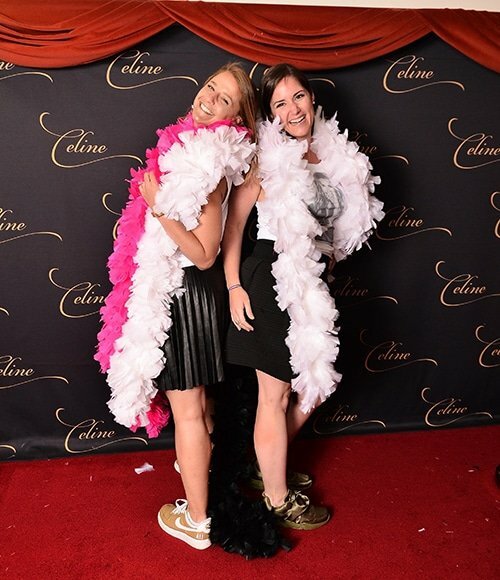 I was convinced Céline had healed me! I didn’t make a single run for the bathroom on the entire flight home! Then the week started and work got crazy and now I’m back to being in not-so-great shape. But YOLO. 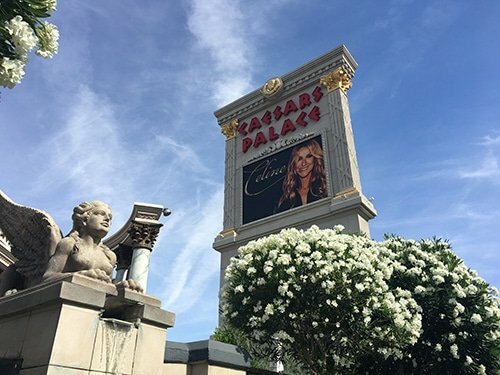 I went to Las Vegas and saw Céline Dion at The Colosseum and life is so good. 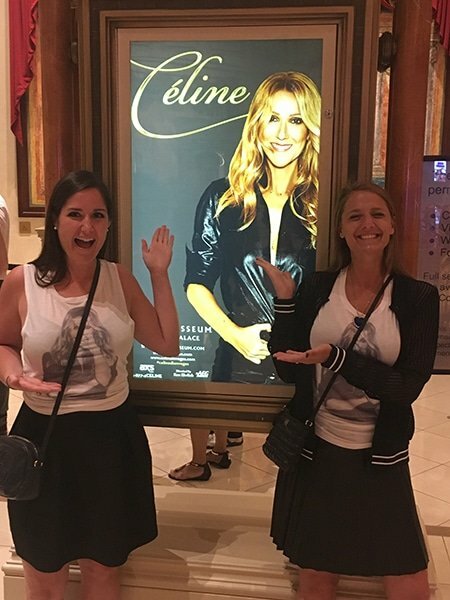 Vegas & Celine sound like a blast. And OMG yes Big Little Lies is so good. Have you finished it? YES! Have you?! Can we talk about it? I was SURPRISED by who was hurting Amabella (I won’t say who I thought it was going to be in case you haven’t finished! ), but was not surprised by who died. I was, however, surprised by how it happened, and I loved it. I love all the women on this show. Well, I don’t love Jane, but I also don’t love Shaielaenelaelene Woodley as an actress, so that’s probably why. YOUR TURN. I LOVED Big Little Lies too! Wasn’t the music amazing? It was so good I almost don’t want them to do another season because I’m afraid they will ruin it. I was also having to drive over the Bixby Bridge every week for work while I was watching the series so it was perfect timing! 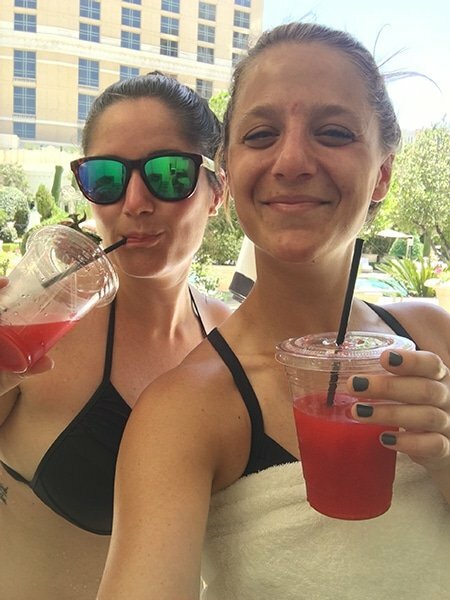 True Vegas story: I went with my mom when I turned 21 because I’m super cool like that. We got drinks at some cheesy place where they offered tequila “floaters” on top of our drinks. My mom, who doesn’t really drink, thought they were offering the floaters “because the drinks weren’t strong enough.” She proceeded to dance down the strip…until stopping to cry at the Bellagio fountain, also playing Time to Say Goodbye. OMG this story. I love it too much. OMG Big Little Lies was amazing. I was so pleased with how they brought it to life. Can HBO do wrong? I think not. Also, Vegas, I have such a love hate relationship with it. I’ve seen some incredible shows there, including Celine twice. However, I am so tired of going there for work and crave a girls trip like you had! SO glad you had fun!!! I’ll help you check off the La La Land and will come over for an afternoon of pool + movie! 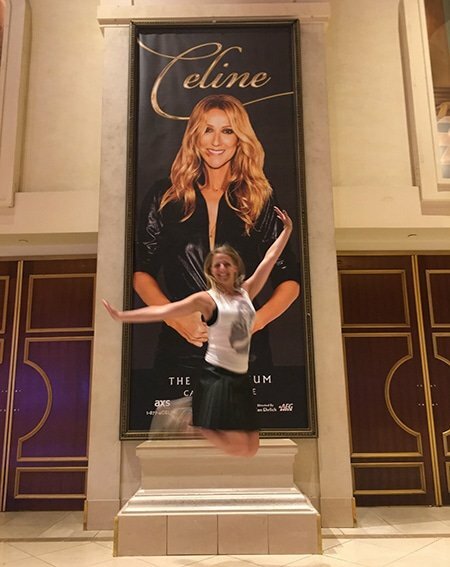 I love Vegas and now want to see Celine. 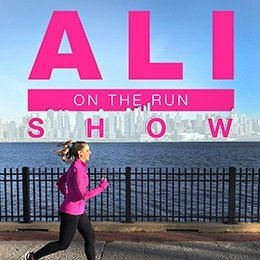 I’m heading to Vegas next weekend and staying at the Bellagio – were there sidewalks the whole time on your run to the stratosphere? I’d love to follow the sand route. Yes, there were sidewalks the whole way in both directions! And only one overpass to deal with when running toward the Stratosphere, which is nice! HAVE SO MUCH FUN! SEE CELINE! Those gold nikes….vegas shoe perfection!! And while I’m not a massive fan, I think I need to find a time to travel to vegas and see her! You can definitely see your enthusiasm in the work you write. The sector hopes for more passionate writers such as you who aren’t afraid to say how they believe. All the time go after your heart. BEST TOUR GUIDE. BEST CABANA MATE. BEST DOLLAR+ SLOT PLAYER. BEST BLL COMPANION. 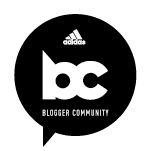 BEST DRESSED….I could go on and on, ALL the superlatives. 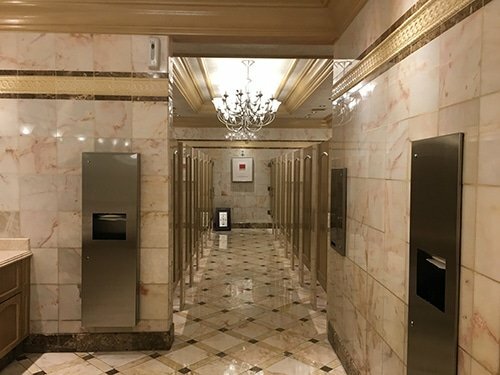 THANKS FOR TAKING ME TO VEGAS, #yoloceline2017 #neverforget.